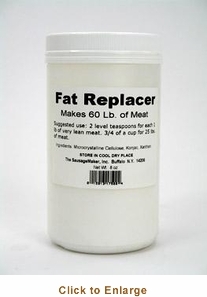 You�re viewing our Sausage Maker fat replacer � 1/2 lb. TSM's CKX fat reducer-cholesterol fighter fat replacer product simulates the creamy texture of fat. Imagine making homemade sausage patties with lean meat but the full flavor of fatty sausage! Use this fat replacer with lean meats in hamburgers, Italian sausage, chorizo, breakfast sausage, meatloaf, any type of fresh venison sausage, salamis and smoked sausages. 2 tsp. for every 1 lb. of lean meat. 3/4 cups for every 25 lbs. of lean meat. 1/2 lb. will process 60 lbs. of meat. We are available to answer any questions you may have about our products. 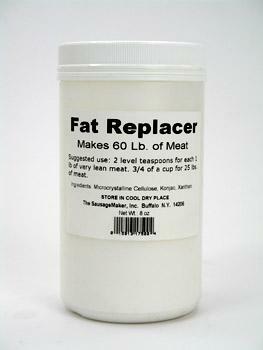 Scroll down to view our Sausage Maker fat replacer � 1/2 lb.